In 2018, Northeast Catholic College formed a special partnership with Fr. Michael Gaitley and the Marian Missionaries of Divine Mercy, to provide spiritual direction to her students. Through this partnership, students of Northeast Catholic have the opportunity to participate in retreats, courses, and service opportunities led by Fr. Gaitley and the Missionaries. During their four years at the college, students can immerse themselves in the spirituality of such saints as John Paul II, Thérèse of Lisieux, Faustina Kowalska, Maximilian Kolbe and Mother Teresa of Calcutta. 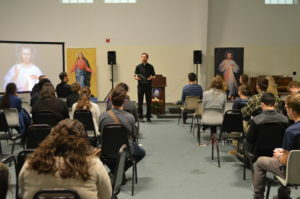 Through this relationship with the Marian Missionaries, students have a unique opportunity to grow in their understanding and experience of key sources of the spirituality of our patron, Pope Saint John Paul II, particularly his emphasis upon Divine Mercy and Marian devotion. To foster this encounter, each Marian Missionary seeks to overcome his lack of trust in God’s goodness and the “distorted image” of God that are results of original sin (Catechism, 397, 399). He does this especially in two ways: first, by fostering a deep, filial Marian devotion (especially through Marian consecration), knowing that Mary effectively obtains for us the grace to understand, accept, and trust in God’s mercy; second, by studying and living the Divine Mercy message and devotion, especially by keeping before his eyes the Image of Divine Mercy, which serves as a powerful reminder of the true face of our infinitely merciful God. By striving to turn away from sin while coming to know, accept, and trust in God’s mercy, Marian Missionaries become filled with the joy of the Gospel, which they generously share with others as they give testimony to the goodness, love, and mercy of God. More information about the Marian Missionaries is available here: www.marianmissionaries.org. For more information about the Marian Missionaries’ work at Northeast Catholic, contact Michael Beecher at [email protected] or call 603-456-2656.